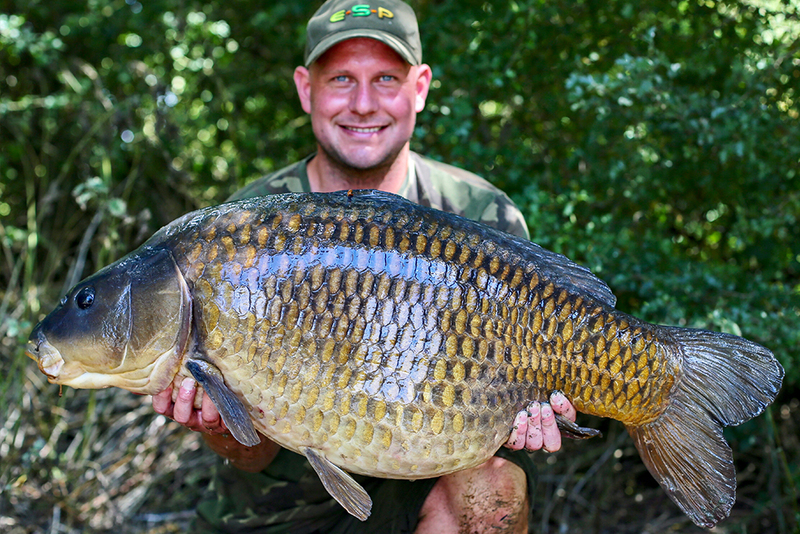 Home > Kev Hewitt – Off to a flyer! I arrived at 11am proceeded to make a clockwise lap around the lake stopping in every swim to spot fish. It didn’t take long to spot backs and shoulders breaking the surface and glistening in the late morning sunshine. There were only five anglers on the lake and they were all in the process of packing up. I had the pick of the lake, all thirty acres of it. One end was far weedier than the other and I could see plenty of carp cruising in and out of the weedbeds and passing over the clearer areas. This seemed a great place to start so I headed back to the van and loaded up the barrow. 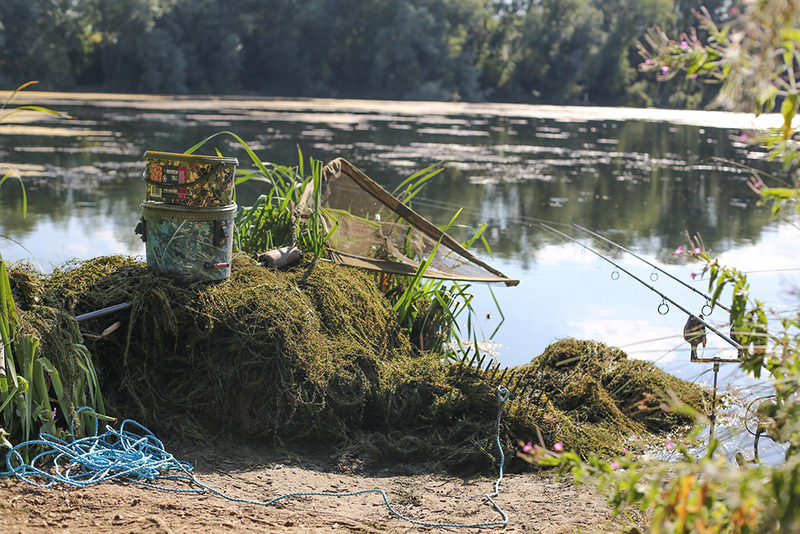 Anywhere that is weedy with clear areas is carp heaven and although these areas can be very off putting and daunting to many, I feel that if you fish strong and think about it a little then you can really swing the odds into your favour. For my bottom fishing I had set up two rods loaded with the ultra reliable and robust 15Lb ESP Syncro with Tungsten Loaded Tubing threaded to an Adjustable Lead Clip. I decided to start out on my favourite rig, the Ronnie with a size 6 Cryogen Curve in barbless. Even though it was weedy, I opted for my old 12ft 2.75Lb tc MK2 ESP Snipers with it mainly being close range work up to 80 yards. I laid the barrow to rest on even ground and looked diagonally across the lake which almost resembled a football pitch, such was the abundance of surface weed. The swim was shallow and you could literally see the bottom in the crystal clear waters for up to 50 yards out. I soon spotted a decent fish mooching round on the edge of a big weed bed at around 40 yards. I could clearly see it was a good one too. “I wonder if he is up for a floater” I thought. I put a half filled spomb of CCMoore 6mm Floating trout pellets up wind of the fish and quickly set up the floater rod. Once the 15Lb Double Strength hooklink was attached I looked up just in time to see a couple of pellets becoming engulfed off the surface. I quickly cast a controller out to the right of the fish and past it and gently eased the CCMoore Duo floater hookbait back into the zone. The carp swap straight past the bait before doing a full circle and was straight onto the floaters. It arched round and was heading straight towards me with its colossal shoulders right out of the water. As it approached my Duo floater hookbait his head lifted so far out the water I would no longer see the hookbait. As his head and shoulders started to submerge I struck and instantly connected with what was clearly a big fish. I had only had the rod in the water perhaps a minute and I was already doing battle with a unit. The fish just wallowed in the crystal clear water and I guided it straight towards me and into the net first time. It really was a totally tame fight but I wasn’t going to complain. 37lb 6oz of common carp taken within minutes of casting! I was soon hoisting my prize onto the scales and the needle settled at a whopping 37Lb 6oz, it really was a dream start! The frame of the fish was huge, I am sure it would have been well over 40Lb pre spawning.That was the only fish I saw for the next few hours, so I decided to have a cast around for a spot to put some bait on. I actually found two spots; one was 40 yards out in a big clearing fully surrounded with weed. It was crystal clear and just felt like a spot that had been fed on recently. The second spot was further right in a bigger clearing up against a weed bed at 55 yards. This spot was a little softer and had a few strands of weed on top. I initially started off with both rods on the clearer spot but after much deliberation I felt it would be better to spread my rods to avoid dramas if I were to get hooked up to a carp. The line lay was horrendous, even with a tight line and a heavy lead the line was still just led on the surface resting on weed beds three quarter of the way to the spot. I decided the swim needed a little maintenance if I were to give myself a reasonable chance of landing a fish or two so I headed back to the van and fetched a weed rake. I spent the next couple of hours dragging in weed from as far as I could throw the rake and then I got a Gardner weed rake out attached to 40Lb braid and dragged a channel to get a better line lay and a better chance of guiding a fish to the bank, or so I thought anyway. I got the rods out on each spot by about 9pm and baited with a few kilos of my favourite mix including hemp, sweetcorn and 10mm Live System boilies. Whenever starting on a new venue, I always go straight in with bait that I have the utmost confidence in. I didn’t have to worry too much as I had my first carp at 2am, followed by more at 6am, 8.30am and 10am. The best being a rare mirror of 26Lb 6oz. Each fish was a real slog trying to land and I ended up dragging in huge weed beds but each time there was a fish in the middle and each and every one ended up in the back of the net. In amongst the carp I also landed 8 tench and by mid day I was shattered. I hadn’t anticipated such prolific action on my first trip and I had now totally run out of bait. 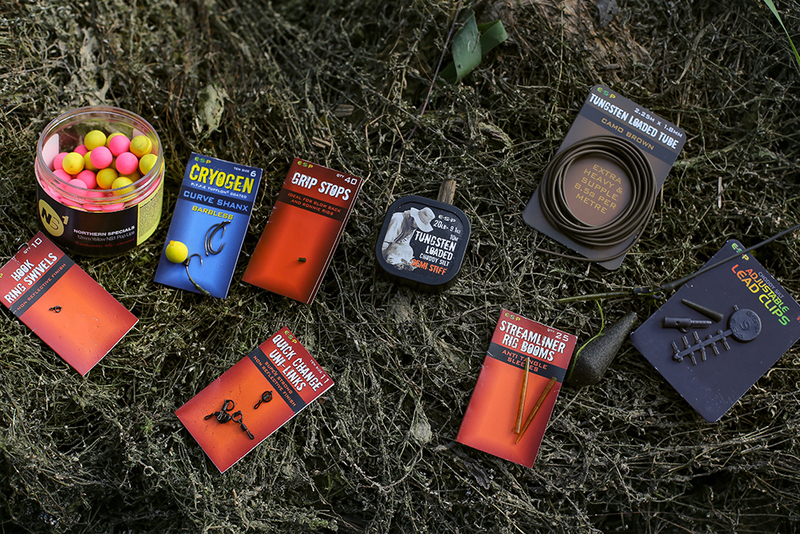 I wound in and drove home in the afternoon to stock up on bait and headed to the tackle shop for some mozzie spray. The little nippers were destroying me all through the night. I spent another hour or so raking the swim in the evening hoping to make landing fish easier but no sooner had I finished, the gently breeze had blown more rafts of floating weed into my swim. I had a slight change of tactics for the second night. I had to be in work early in the morning and could be dealing with fighting through tench all night so I loaded the swim with much bigger baits, 15mm Live system shelf life with a little hemp and corn. My first bite came at 11pm and after dragging in a car engine sized weed bed, I shuffled the net under and had the fish over the net but the weed bed was so big I simply couldn’t lift the net to get the fish in. I even stroked the fish on the head as I tried to peel back the weed then the fish bolted and got away. I was gutted to have had it over the net and even touched the fish and then ended up losing it. Oh well you can’t win them all. The only problem is, my next bite came at 5.30am and exactly the same happened again! It had taken me about twenty minutes of pumping to get the fish and the weedbed into the margins and then she shed the hook. I thought that was going to be my last chance as I had to pack up at 7am for work but fortunately my right hander peeled off at 6.30am. The fight followed the same pattern as the others and after twenty minutes I had the mountain of weed with fish in the middle under the rod tip and again at this point it managed to free itself from the weed and bolt off. The only problem was my line was going through the weed. 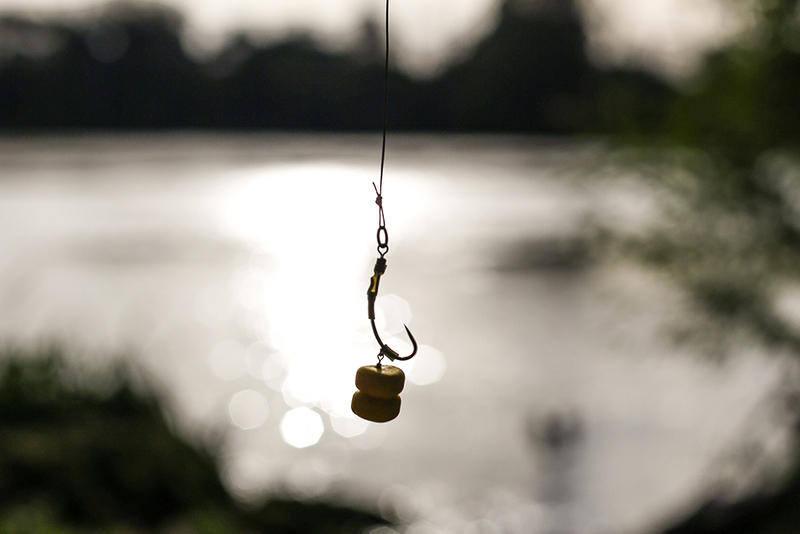 I waded out and frantically peeled back rafts of week off the line and eventually got back in contact with the fish. A few minutes later, and I breathed a huge sigh of relief as she lay in the folds of my net. Onto the scales she settled at 32Lb 6oz and as I slipped her back the alarm on my phone sounded signaling time for work. The switch to using a higher percentage of bigger boilies in the mix was enough to keep the tench away as I never had another tench bite after payloading with 15mm baits. I was a little gutted to lose a couple of carp though, but overall I was ecstatic to have landed so many carp on my first trip and I simply can’t wait to get back.